Jenna Fischer in "A Little Help. Jenna Fischer at the California premiere of "Hall Pass." Jenna Fisher arrives to the 17th Annual Screen Actors Guild Awards. Gordon Prend and Jenna Fischer at the after party of the New York premiere of "Solitary Man." Jenna Fischer and Seth Meyers at the after party of the New York premiere of "Solitary Man." Jenna Fischer and John C. Reilly in "Walk Hard: The Dewey Cox Story." Jenna Fischer at the New York premiere of "Solitary Man." Jenna Fischer at the 57th annual ACE Eddie Awards in Beverly Hills. Jenna Fischer at the NBC TCA Party in Los Angeles, California. Jenna Fischer at the NBC Primetime Preview 2006-2007 in New York City. Jenna Fischer at the LA Confidential Magazine in Los Angeles, California. Jenna Fischer at the NBC upfront in New York City. Jenna Fischer at the TV Guide & Inside TV 2005 Emmy after party in Hollywood, California. Jenna Fisher at the premiere of “Blades of Glory” in Hollywood. Jenna Fischer at the Universal Media Studios Emmy Party in Malibu, California. Jenna Fischer at the West Coast premiere of “The Last Mimzy” in Los Angeles. Jenna Fischer at the Entertainment Weekly Magazine Party Celebrating the 2006 Photo Issue in Hollywood, California. Jenna Fischer at the NBC/Universal Golden Globe After Party in Beverly Hills, California. Jenna Fischer at One Night Only: A Concert for Autism Speaks in Los Angeles. Jenna Fischer at the fuse Fangoria Chainsaw Awards in Los Angeles. Jenna Fischer at Variety's Centennial Gala in Beverly Hills. 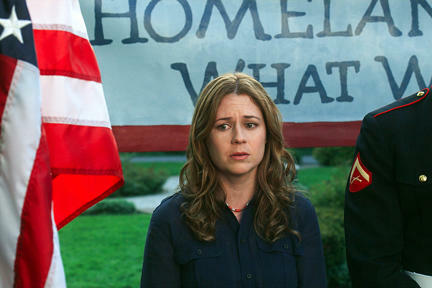 Jenna Fischer at A Time for Heroes Celebrity Carnival in Brentwood, California. Jenna Fischer at the premiere of “The Last Mimzy” in Los Angeles. Jenna Fischer at the premiere of “The 40 Year-Old Virgin” in Hollywood. Jenna Fischer at the premiere of “American Dreamz” in Hollywood, California. Jenna Fischer at the NBC Upfronts in New York City. Jenna Fischer as Maggie in "Hall Pass."